Welcome to the Talon Mailing & Marketing September 2015 Newsletter. In a world dominated by the Internet, it is all too easy to assume that email marketing reigns supreme compared to “old fashioned” postcard marketing. Business owners who buy into that assumption, however, can find themselves facing poorly performing marketing campaigns and disappointingly low returns on their investment. #1: It works better, especially for prospecting and also for making sales. There is no question email can be highly valuable for nurturing leads over time and for providing your audience with company news and other updates. But every business needs a continuous supply of new customers in order to grow, and for that, mail marketing – especially the small-but-mighty postcard – outperforms email. By 10-30 times, according to a DMA (Direct Marketing Association) study. That’s because almost half of postcard recipients take the time to read your mail. Better yet, they take action. A Direct Mail Marketing Association survey showed about a quarter said they visited the company’s store and 21% visited their website. And that’s in addition to recipients who picked up the phone to call and set an appointment, etc. It comes down to targeting. It’s hard to come by top-quality email lists for prospecting, whereas it’s easy to zoom in your targets using mailing list selection criteria. #2: Your prospects prefer direct mail. Most people find it creepy (or worse, violated) to receive unsolicited emails. Who are these people anyway, and how did they get my email address? But years of studies prove the majority of people love to receive marketing postcards in the mail. Postcards feel more personal and more trustworthy. There’s no doubt who it’s from, and no doubt what you have to offer. Half of consumers specifically prefer postcard over email, according to a study conducted by Epsilon. Even more impressive, a full 70% of those surveyed said they prefer to receive unsolicited information via mail. For some product categories, that number can be even higher. It’s not surprising, really. Mail makes people feel more in control. There’s something else working here, too – subtly but unmistakably. Your prospects can touch a postcard and interact with it. It’s “real.” People like that. #3: That’s why they’re more likely to look at it. People will relegate an email to the “spam” folder in a heartbeat, but they’re happy to “open” your postcard and check out your offer. In fact, postcard mailing deliverability is typically 95%. Email prospecting lists are dismal in comparison. But here’s a bonus: you can use postcards to boost open and click-through rates for email nurturing campaigns. Because direct mailing is deemed trustworthy, it helps pave the way – letting recipients know the email you’re about to send them is legitimate and potentially worthwhile, not just something to be automatically discarded. #4: It is more versatile. Email certainly has its place. It’s great for nurturing leads and driving “mini-conversions” and it can strongly support certain kinds of inbound marketing campaigns. But direct mail does it all – prospecting, solicitation of referrals, upselling and cross-selling existing customers and win-back campaigns directed at former clients or customers. What former customer is likely to open your email? It performs beautifully and consistently when used all on its own. It also adds unique value to integrated multi-channel marketing campaigns. It works to drive traffic to your website, enabling you to increase online sales or convert prospects to leads by capturing their email address for future follow up. Postcard marketing simply has more going for it, in all the ways that matter. 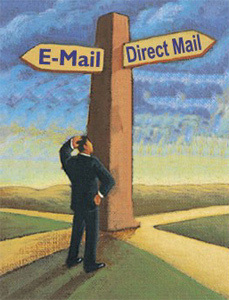 That’s why you should choose direct mailing over email marketing. With nearly 200 million viewers using Ad-blocking software, are clients and prospects seeing your ads? Ad-blocking software, once thought to be a relatively small-scale phenomenon, is apparently rapidly going mainstream. According to a new report from Adobe and PageFair — an Irish company founded in 2012 that “measure[s] the cost of adblocking and display[s] alternative non-intrusive advertising to adblockers” — $21.8 billion in global ad revenues have been blocked/lost so far in 2015. Ad blocking has grown from roughly 21 million users in 2009, according to the report, to 198 million active global users as of June 2015. Globally, ad blocking saw 41 percent growth year over year. In the US, it grew 48 percent and now has 45 million active users. According to comScore, there are approximately 250 million PC internet users in the US. The Adobe-PageFair data argue that about 18 percent of the US internet population is blocking ads. According to estimates in the report, there was $5.8 billion “in blocked revenue” in the US in 2014. The number is expected to reach $10.7 billion this year and $20.3 billion by 2016. The report projects $41.4 billion in potential ad revenue blocked next year on a global basis. Chrome is the browser that has seen the greatest installation of ad-blocking plug-ins. However, Firefox and Safari are also seeing ad-blocking growth. The report asserts that ad blocking occurs most among the young, technically savvy and male audiences. Accordingly, sites that rely upon those audiences are seeing the most lost revenue from ad blocking; gaming and social networking are chief among them. More than 98 percent of ad blocking now occurs on the PC. However, ad-blocking extensions currently exist for the mobile versions of Chrome and Firefox. In addition, iOS 9 will allow ad-blocking apps. All of this suggests that mobile ad blocking will grow in the future, especially as the online ad-blocking population becomes aware of these mobile tools. A survey of 400 US users conducted for the report found that among those not using ad-blocking software today, potential reasons to start were: 1) misuse of data for ad personalization; and 2) increase in the quantity of ads. Overall, these findings argue for more relevant ads, more privacy and data use transparency, better creative and overall ad quality. Publishers and agencies shouldn’t simply take it as given that consumers will be accepting of online ads. There is something worse than non-attention: active blocking. Indeed, if these numbers are accurate, ad blocking represents a major emerging problem for digital publishers and marketers. A caveat about the report, however: it’s in PageFair’s interest to generate concern about the size and growth of ad blocking. I’m not suggesting any of the numbers are fabricated. I am suggesting the company has incentives to present the most aggressive version of the current state of ad blocking the facts allow. Having said that, there’s probably no question that ad-blocking numbers are growing and that revenue is being lost accordingly. Wednesday September 9th, 2015. Yankees vs. Orioles 7:05 PM. nodesk.co - NODESK is a curated collection of resources about the digital nomad, location independent working and online entrepreneurship lifestyle. clonezone.link - Clone Zone is a web cloning tool that lets you edit the content of any website on the internet and share the result on social media. morningtraffic.info - Get a text message every morning when you wake up with the best (least traffic) route to work. donottrack-doc.com - Do Not Track is a personalized documentary series about privacy and the web economy. inverse.com - Inverse covers the latest news, TV, movies, music, digital culture, science and tech by asking: What could happen next?